Only the Fourth Wall and their hit Fringe touring series of Fruit Flies Like A Banana could get Mom and me to venture into Family Fringe territory over at Celtic Junction (the other draw was Hit The Lights, of course, but they’ve got another show in the regular Fringe as well, so we’ll catch them there). It’s not so much that Celtic Junction is physically removed from the regular Fringe by distance. It’s that the Family Fringe schedule is also out of kilter with regular Fringe showtimes. If you were able to race across town, it’s possible you could make it, but it’s not advisable. Plus Mom and I both move a lot slower these days. A sprint is out of the question. Mom is also loathe to lose a Fringe slot in any of her limited days at the festival. She takes pride in doing all 30 slots available to her these past several years. But, for the Fourth Wall and Fruit Flies, we will do it. Once you make peace with that, there’s the bonus of having a little extra time to get there before, and so much time after, that we were able to meet with some Fringe friends who Mom hadn’t seen in a while for some nachos at Can Can Wonderland. Then off for the final two showtimes of the day. I’m tempted to say that the hybrid performance magic of The Fourth Wall is wasted on children. But that’s mean to children. Of course they should have the joy of seeing three multi-talented people play musical instruments while dancing around the stage, contorting their bodies and playing music in positions from which people don’t normally play music - it’s theater, it’s dance, it’s music, all rolled into one fast-moving and entertaining package. 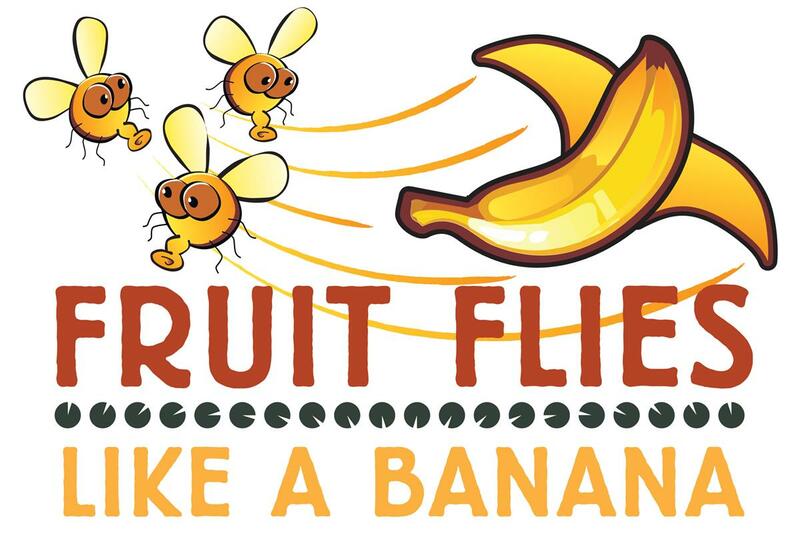 This time, Fruit Flies is a throwback to the original way in which we saw them, only with three more years of new musical material under their belts to play with. Back in 2015, Fruit Flies flew through multiple short pieces of music and performance in random order determined by the audience picking from a big deck of cards, each card with the title of a different piece on it. Each chosen card was tossed to the floor, accumulating as the performance went on, and the clock ticked down from 50 minutes to zero (they made it with a minute and a half to spare this time - so we got a little encore extra number at the end to finish out the time). Any one who’s seen Fruit Flies before will be familiar with a lot of what happens here. It’s sort of a “greatest hits” compilation from the previous three years of touring. But since no one else is doing anything quite like what the Fourth Wall is doing, Mom and I only get to see magic in action like this once a year. The music is delightful and varied. The physical performance is enchanting. And the trio of Hilary Abigana (on flute, among other things), Greg Jukes (on vibraphone, among other things), and C. Neil Parsons (on trombone, among other things) know how to work the younger crowd perfectly. The kids get to pick all the cards, of course. And there’s always plenty of volunteers ready for audience participation (and they make sure everyone gets a turn, which isn’t easy). They even know how to handle it when - bewitched by the reappearance of boomwhackers onstage, which were such fun before - the kids all rush the stage again. With help from parents, the children return to their seats on the colorful pillows on the floor, and (surprisingly) watch the musicians do their work. It’s just a shame these kids don’t realize how hard it is to do what the Fourth Wall does. The kids are still enthralled, of course. They pay such close attention that one child shouted, “You’re running out of time!” as the clock ticked down. But it’s only when these youngsters try someday to play a musical instrument sitting down or standing still, and try to get beautiful sounds to come out, that they’ll realize what a wonderful gift it is to be able to play music, much less play music while moving around at the same time. But hopefully their exposure to how much fun this seems, and all the different musical instruments Hilary, Greg and Neil play, will capture some kids’ imaginations and turn them into budding musicians as well. One can only hope. Because we need more entertainers fusing music and physical theater (and wonder) the way The Fourth Wall does with Fruit Flies Like A Banana.